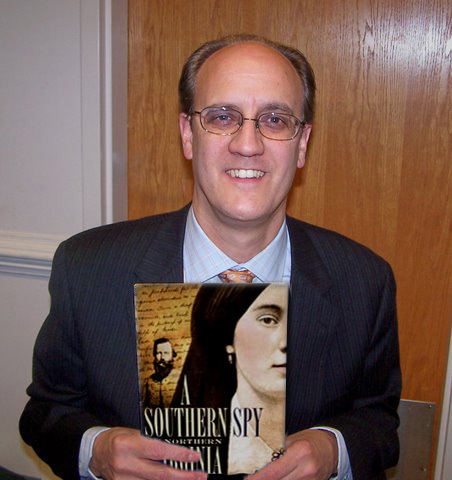 Chuck Mauro holds a copy of his book "A Southern Spy in Northern Virginia". Chuck Mauro is the author of "A Southern Spy in Northern Virginia: The Civil War Album of Laura Ratcliffe," "The Civil War in Fairfax County: Civilians and Soldiers," "The Battle of Chantilly (Ox Hill): A Monumental Storm," "Herndon: A Town and Its History," and "Herndon: A History In Images." Recorded on September 9, 2010 at the Bull Run Civil War Round Table meeting. The duration is 67 minutes.